Before I get into this post, let me clear up some things that might confuse people new to the ‘verse. In the ‘verse, Serenity is a popular name. What makes it popular is a tad annoying to newcomers . . . it is the name of the Firefly Class ship the Big Damn Heroes fly around in, and it is the name of the Firefly series pilot the idiots at Fox did not air until the series was cancelled, and it is the name of the Universal Studios 2005 movie. 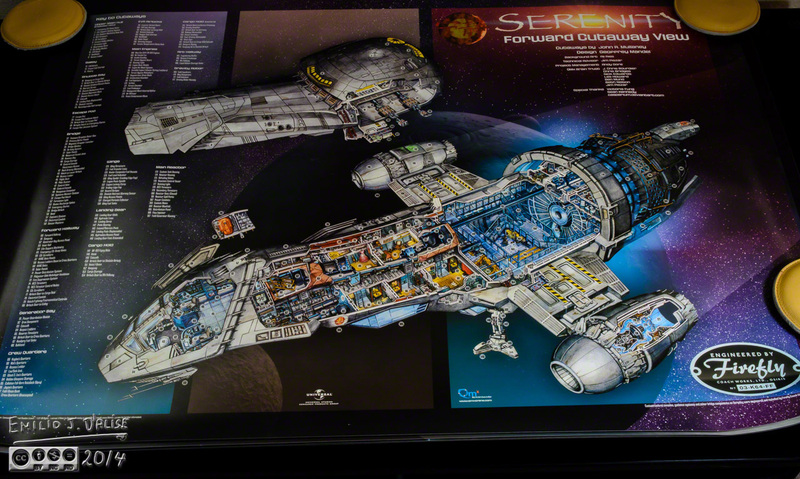 In these posts we’ve been talking about Serenity the ship. So far we’ve seen two related products aimed at giving the interested fan more comprehensive understanding of Firefly’s 10th character. You can click on the photo for a larger view. The details are exquisite and extensive . . .
. . . with everything numbered and referenced in the legend. This time you see a better representation of Kaylee’s dress, along with her parasols. You also see Vera (by the way, you can see how one fan built one using a 3-D printer HERE), Zoe’s holster (it carries her Mare’s Leg), and one of Wash’s shirts. The one I don’t get is why Mal has a plant in his room. By the way, the circular stitched leather thing you see in the frame is one of four lead weights I still own and use . . . they are relics from 1978, when I started working at Cadillac Motor Company, and one of my first assignments was as a detailer in the drafting room. The weights were used to hold down paper and vellum drawings in the pre-CAD days. 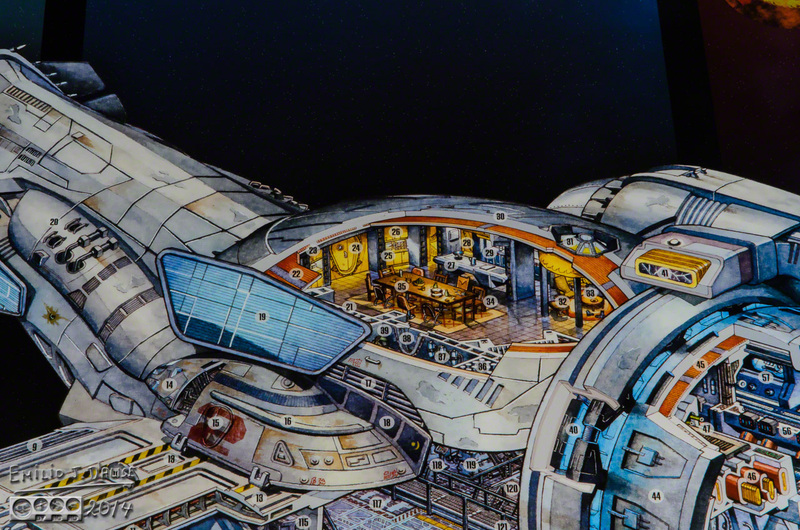 Now they hold down architectural drawings of spaceships. Anyway, there is a PDF documenting the process of generating these drawings, and it can be found HERE. It is downloadable and printable, although it’s only 8.5×11 inches. 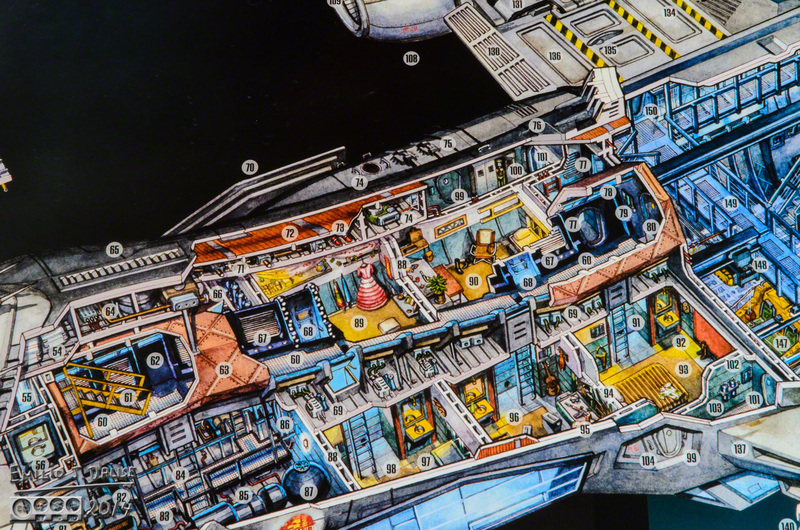 This can be seen in the above closeup of the crew’s quarters, and here’s the Aft Cutaway view, with a closeup of the Galley/Lounge. Again, you can click on the photos for larger versions (not the legends; they are large enough to read as is). The other two sheets have Inara’s shuttle and the flying mule. I have a lot of links in this post, and most people will ignore them, and because of that, I am going to add yet more links. I mentioned Kaylee’s dress and parasol (go to 1min 11sec mark). . . 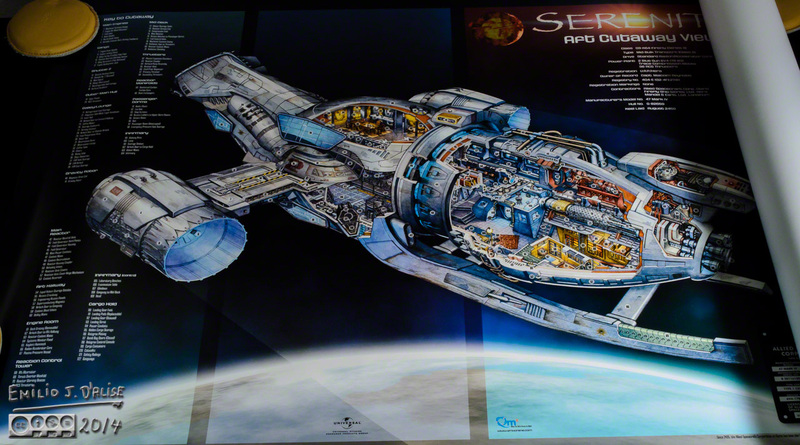 This entry was posted in entertainment, Photography Stuff and tagged entertainment, FireFly, Serenity, Serenity Blueprints, Serenity Cutaway Views. Bookmark the permalink. All I can think of writing is that this is a good feeling post. Love the cutaway prints and totally enjoyed the videos (I had not seen Mel dress up in Castle). If you search YouTube, there are a lot of Firefly and Serenity hints in Castle (two by two, hands of blue – is the first I remember).